While popular reaction to the new government has been mixed, business leaders have praised the stability that the new Cabinet brings. Most investors want to avoid radical changes in government but it is clear that some change is needed. The steady-as-she-goes crowd have commented optimistically on a couple of the new appointments. The promotion of former presidential economic adviser Arkady Dvorkovich to the post of deputy prime minister for industrial and energy policy is seen as a big step forward for the liberal camp, as Dvorkovich, like his former boss German Gref, talks sense. Part of his brief will be to oversee the energy sector. 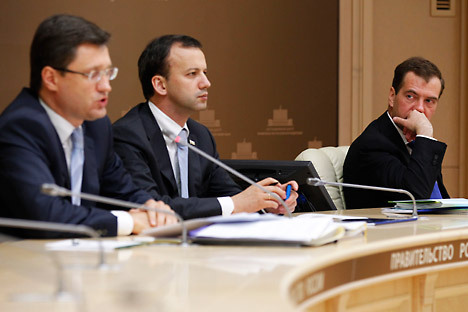 The appointment of the relatively unknown Alexander Novak to oversee the energy portfolio came as a surprise, as Novak is not an oil man but comes from the Finance Ministry. At the same time, the departure of Siloviki top dog Igor Sechin shakes up the control structure of the energy industry. He will now head Rosneftgaz, the holding company that owns the state’s stake in the oil major Rosneft. It is assumed that Sechin will remain de facto in charge of energy. He will clearly be responsible for operational issues on the sector’s development. Massive investment is needed, and deals galore will have to be cut with foreigners to develop the Arctic, the Barents Sea gas deposits and open up Eastern Siberia. Andrei Belousov, appointed as head of Economic Development, is a respected economist who is close to Putin and supports his preferences for state spending. The plan, it seems, is to extract more revenue from natural resources and spend it on big state initiatives to promote diversification and growth. The massive 20 trillion rouble spending programme on the military-industrial sector will be one of the main beneficiaries of the revenue, and Putin is committed to making this plan work. The wisdom is questionable – former finance minister Alexei Kudrin quit over the issue. But while the economics are doubtful, you can see why Putin wants to do it: negotiations on the West’s missile shield continue, and from the Kremlin it looks like a threat to national security. Other appointments are a mixed bag. Generally, we can expect more of what we had for most of the past decade: steady progress with reforms, but nothing to catch the headlines and plenty of mishaps in the implementation. While a dramatic change in the government would be exciting, so long as Putin continues to improve the quality of life, for the business community at least, steady as she goes is fine. Ben Aris is the editor and publisher of Business New Europe .